There are about 500 different species of gorgonians found in the oceans of the world, but they are particularly abundant in the shallow waters of the western Atlantic, including Florida, Bermuda, and the West Indies. The structure of a gorgonian colony varies. In the suborder Holaxonia, skeletons are formed from a flexible, horny substance called gorgonin. The suborder Scleraxonia variety of gorgonians are supported by a skeleton of tightly grouped calcareous spicules. There are also species which encrust like coral. Most of Holaxonia and Sclerazonia, however, do not attach themselves to a hard substrate. Instead, they anchor themselves in mud or sand. Research has shown that measurements of the gorgonin and calcite within several long-lived species of gorgonians can be useful in paleoclimatology and paleoceanography, as the skeletal growth rate and composition of these species is highly correlated with seasonal and climatic variation. Soft corals contain minute, spiny skeletal elements called sclerites, useful in species identification. Sclerites give these corals some degree of support and give their flesh a spiky, grainy texture that deters predators. In the past soft corals were thought to be unable to lay new foundations for future corals, but recent findings suggest that colonies of the leather-coral genus Sinularia are able to cement sclerites and consolidate them at their base into alcyonarian spiculite, thus making them reef builders. Unlike stony corals, most soft corals thrive in nutrient-rich waters with less intense light. Almost all use symbiotic photosynthesizing zooxanthella as a major energy source. However, most will readily eat any free floating food, such as zooplankton, out of the water column. They are integral members of the reef ecosystem and provide habitat for fish, snails, algae and a diversity of other marine species. Despite being dominated by "soft corals", the order Alcyonacea now contains all species known as "gorgonian corals", that produce a more or less hard skeleton, though quite different from "true" corals (Scleractinia). These can be found in suborders Holaxonia, Scleraxonia and Stolonifera. Many soft corals are easily collected in the wild for the reef aquarium hobby, as small cuttings are less prone to infection or damage during shipping than stony corals. Nevertheless, home-grown specimens tend to be more adaptable to aquarium life and help conserve wild reefs. Soft corals grow quickly in captivity and are easily divided into new individuals, and so those grown via aquaculture are often hardier and less expensive than imported corals from the wild. Fossil gorgonian holdfast on a Miocene limestone surface, Czech Republic. Each gorgonian polyp has eight tentacles which catch plankton and particulate matter that is consumed. This process, called filter feeding, is facilitated when the "fan" is oriented across the prevailing current to maximise water flow to the gorgonian and hence food supply. 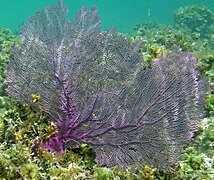 Some gorgonians contain algae, or zooxanthellae. This symbiotic relationship assists in giving the gorgonian nutrition via photosynthesis. Gorgonians possessing zooxanthellae are usually characterized by brownish polyps. Gorgonians are found primarily in shallow waters, though some have been found at depths of several thousand feet. The size, shape, and appearance of gorgonians can be correlated with their location. The more fan-shaped and flexible gorgonians tend to populate shallower areas with strong currents, while the taller, thinner, and stiffer gorgonians can be found in deeper, calmer waters. Other fauna, such as hydrozoa, bryozoa, and brittle stars, are known to dwell within the branches of gorgonian colonies. The pygmy seahorse not only makes certain species of gorgonians its home, but closely resembles its host and is thus well camouflaged. Two species of pygmy seahorse, Hippocampus bargibanti and Hippocampus denise, are obligate residents on gorgonians. H. bargibanti is limited to two species in the single genus Muricella. ^ van Ofwegen, L. (2011). "Alcyonacea Lamouroux, 1812". World Register of Marine Species. Retrieved 15 December 2011. ^ Gorgonacea World Register of Marine Species. Retrieved 2011-12-04. ^ Gorgonacea; Lamouroux, 1816 ITIS Taxonomy. Retrieved 2011-12-04. ^ a b c Borneman, Eric H. (2001). Aquarium Corals: Selection, Husbandry, and Natural History. Neptune City, NJ 07753: T.F.H. Publications. p. 464. ISBN 1-890087-47-5. ^ "Sea Fan". University of Delaware Graduate College of Marine Studies. Retrieved 23 September 2007. ^ a b Goldstein, Robert J. (1997). Marine Reef Aquarium Handbook. Barron's Educational Series, Inc. p. 198. ISBN 0-8120-9598-7. ^ Heikoop, J.M. ; M.J. Risk; C.K. Shearer; V. Atudorei (March 2002). "Potential climate signals from the deep-sea gorgonian coral Primnoa resedaeformis". Hydrobiologia. 471 (1–3): 117–124. doi:10.1023/A:1016505421115. ^ Sherwood, Owen A.; Jeffrey M. Heikoop; Daniel J. Sinclair; David B. Scott; Michael J. Risk; Chip Shearer; Kumiko Azetsu-Scott (2005). Cold-Water Corals and Ecosystems. Erlangen Earth Conference Series. Springer Berlin Heidelberg. pp. 1061–1079. doi:10.1007/3-540-27673-4. ISBN 978-3-540-24136-2. ^ Bond, Zoë A.; Anne L. Cohen; Struan R. Smith; William J. Jenkins (31 August 2005). "Growth and composition of high-Mg calcite in the skeleton of a Bermudian gorgonian (Plexaurella dichotoma): Potential for paleothermometry". Geochemistry Geophysics Geosystems. 6 (8): Q08010. doi:10.1029/2005GC000911. ^ Kenji Konishi, "Alcyonarian spiculite: the limestone of soft corals", 1981; M.-S. Jeng, H.-D. Huang, C.-F. Dai, Y.-C. Hsiao and Y. Benayahu. (15 May 2011), "Sclerite calcification and reef-building in the fleshy octocoral genus Sinularia (Octocorallia: Alcyonacea)", Earth and Environmental Science, Coral Reefs doi:10.1007/s00338-011-0765-z. ^ Haywood, Martyn; Sue Wells (1989). The Manual of Marine Invertebrates. Morris Plains, NJ: Tetra Press:Salamander Books Ltd. p. 208. ISBN 3-89356-033-5. ^ Agbayani, Eli (5 June 2007). "Hippocampus bargibanti, Pygmy seahorse". FishBase. Retrieved 22 September 2007. ^ Berrue, F; Kerr, RG (2009). "Diterpenes from gorgonian corals". Natural Product Reports. 26: 681–710. ^ O'Neal, W; Pawlik, JR (2002). "A reappraisal of the chemical and physical defenses of Caribbean gorgonian corals against predatory fishes". Marine Ecology Progress Series. 240: 117–126. doi:10.3354/meps240117. ^ Attenborough, David (12 November 2017). ""Coral Reefs"". Blue Planet II. Episode 3. BBC One. ^ Pawlik, JR; et al. (1987). "Patterns of chemical defense among Caribbean gorgonian corals - A preliminary survey". Journal of Experimental Marine Biology and Ecology. 108: 55–66. doi:10.1016/0022-0981(87)90130-4. ^ "WoRMS - World Register of Marine Species - Alcyonacea". marinespecies.org. Retrieved 22 March 2018. Wikimedia Commons has media related to Alcyonacea. This page was last edited on 16 March 2019, at 21:20 (UTC).